Bernie grew up in the south and lived for 25 years in Loretta Lynn’s home state of Kentucky. She and her sister, Leslie, an accomplished dancer, sang and performed together in a variety of settings while growing up in the south. Bernie sang for several years in numerous gospel and specialty groups including some country venues. Her love of country music was inspired by some of country’s greatest female artists such as Kitty Wells, Dottie West, Patsy Cline and of course the Queen of Country Music, Loretta Lynn. After seeing and hearing Bernie sing “Coal Miner’s Daughter” in a local competition, the host of the competition invited Bernie to sing at an MDA benefit concert. That is when Bernie was noticed by another tribute artist because of her striking resemblance to Loretta Lynn, her vocals and her natural southern drawl. Ever since that day, Bernie has been performing her amazing tribute to Loretta Lynn all over the state of Michigan. From the country western attire to the ballroom gowns Bernie will leave you astounded with her rendition of such Loretta greats as “Coal Miner’s Daughter”, “You Ain’t Woman Enough to Take My Man” “One’s on the Way” and countless others. She will definitely leave your audience wanting to hear more of Loretta’s greatest hits. While performing her great tribute to Loretta Lynn, Bernie was called upon to fill in for a Pasty Cline tribute artist who had to cancel a performance at the last minute. Somewhat unprepared to look the part of Patsy, Bernie chose to do her performance as a Loretta tribute to her great friend, Patsy. The audience loved Bernie’s renditions of Patsy’s hits such as “Crazy”, “Blue Moon of Kentucky”, “Walkin’ After Midnight” and “So Wrong”. After that performance it wasn’t long until Bernie got the call once again to fill in at another show. It was at this point Bernie decided she wanted to be the best Patsy Cline tribute artist out there so she practiced not only the songs but she also studied Patsy’s history so her tribute is truly authentic. With her deep, powerful contralto voice coupled with her soulful native West Virginia twang, Bernie is able to bring Patsy Cline’s legendary hits alive. 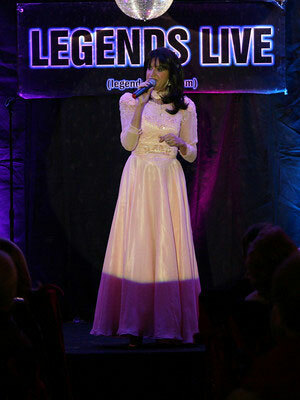 Bernie’s personality is both bubbly and warming which shines through in all her Patsy Cline tribute performances. Bernie says that she is much honored to help keep the voice of this legendary superstar alive. Loretta Lynn - Click Here for Audio 1 / 2.